The latest spawn of Marvel's early summer fling with femme-focused one shots, this month we spend a few minutes with Dazzler. A former member of the X-Men, Ali Blaire was most recently involved in the family's Necrosha event, to which this issue is meant to serve as something of an epilogue. Thing is, while the character is loosely tied to the events of that crossover, (Ali's sister was actually more intimately involved than she was herself) very little of its plot and almost none of its mood is all that tightly connected. At the outset of the issue, writer Jim McCann is at least kind enough to grant his audience a token nod towards present continuity. As usual, Ali's between a rock and a hard place, trying to get her career back on the fast track and hunt down her rogue sister all at the same time. By somewhere around the fourth page, though, most of that has been swept under the rug in favor of a more timeless, run-of-the-mill romp through one of Arcade's expansive, confusing obstacle courses. Longtime fans of the character may find something familiar in that premise, and it won't be the last time they're escorted down memory lane. While newer readers won't have any trouble accepting this issue as a bouncy, if haphazard, little action tale, it's really intended for long-term fans. The fistful of references and throwbacks to Ali's self-titled series from the early '80s will sail right over most folks' heads, while the die-hards will eat them up. It's pure fan service. McCann's a good choice for that kind of story. A self-proclaimed lifelong admirer, McCann cut his teeth with Dazzler on a short story in Marvel Heartbreakers, but hasn't really had the chance to show how well he knows her before this month. His understanding of what makes Ali tick and what she's gone through earlier in life are major positives. The actual power of the story itself, however, doesn't quite reach the emotional peak I think he was searching for, even when the fireworks cease and the story takes more of a focus on its characters. Kalman Andrasofszky and Ramon Perez handle the artwork within the first chapter, detailing Ali's big action scene in Arcade's playground. The two have complimentary styles, but it's still clear as day when they swap panels. Andrasofszky's work is more vivid, his splash pages more striking, while Perez's work is a bit rougher around the edges. Kalman's action scenes are more organized and easy to read, with an emphasis on a few very specific dynamic poses. Ramon's are more like weakly orchestrated chaos. The book changes gears in its final pages, introducing the ultra-minimal style of Francesca Ciregia for the wrap-up. Ciregia's work is more stylized and interesting than the others, often taking its cues from Eduardo Risso's efforts with 100 Bullets, although about once every page I caught myself wishing she'd shown a bit less restraint. Particularly in close-ups, of which there are several during Ali's emotional phone call with her mother, it felt like Ciregia was sacrificing sentiment for the sake of an extremely low line count. Your enjoyment of this issue is going to depend on your existing knowledge and appreciation for the character. 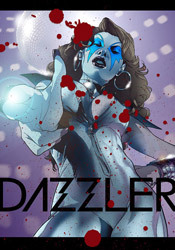 Jim McCann reinforces Dazzler's personality, but he doesn't give her anything new to play around with. He also doesn't spend a lot of time spelling things out for less-invested audiences. Simply enough, what you take out of this one is going to depend on what you put into it. Big fans will find enough to make them flash a retro-induced smile, and longtime haters will only see more fodder to ignite. Neither can claim it's one of the better issues of the character's lifespan. Flip through it. There's something here, but its success is conditional and fleeting.